Back in Chemnitz, the new toy becomes the favourite pastime of Tony and his flatmates. Tony and his flatmate Matthias practice their throwing and catching and come up with their first tricks. They look into the history of the toy and find out that they've got their hands on a piece of Latin American cultural heritage. 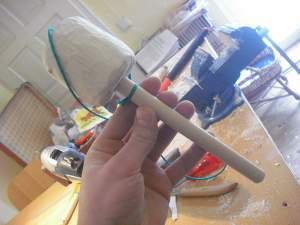 Soon, they develop their own first prototypes, introducing the double-ended handle. 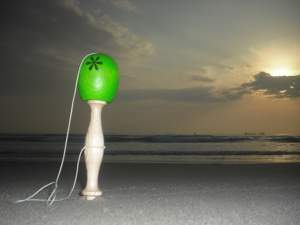 From a simple toy, the Ticayo becomes a juggling success! 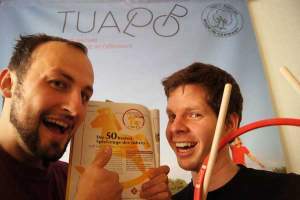 Tony and Matthias start the Ticayo craze, making the game a party favourite among students in the German city of Chemnitz. Wanting to give the new toys away as gifts, they make their first set, using the expertise of woodturners from the Erzgebirge to perfect the design. Thanks to the toy's great popularity, Tony and Matthias decide to start their own toy company. They sell their first Ticayo on May 13th 2011, making the date the official start of TicToys, and founding a completely new way to play. With the first Ticayos made, it's time to distribute the goods. 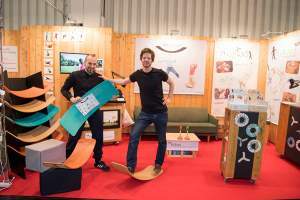 Tony and Matthias visit eco-stores and toy fairs and get to know their new field. Despite the globalized toy industry's focus on quick profits, low quality, and overseas mass production, Ticayo is a success, and the toy's popularity brings the company a “SpielGut” prize, national media attention, and an ever-growing number of Ticayo enthusiasts. After two years, TicToys introduces its newest product: myFibo — 'my first Boomerang'! MyFibo puts an end to the frustration of learning how to throw conventional boomerangs, many of which are hard to use and just won't come back — and even when they do, you sometimes wish they hadn't! 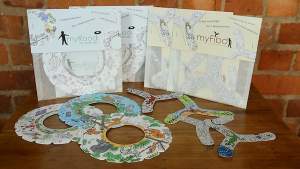 A myFibo set includes four durable cardboard boomerangs which are perfect for indoor use in every living room! 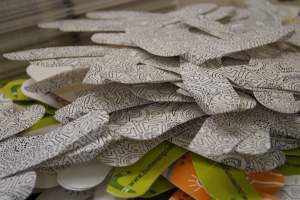 The fibos are very easy to use: they are designed for children age four and up, and they can even be individually coloured. From now on, the TicToys motto is: many happy returns! Our frisbees join the boomerangs in living rooms and classrooms across the country. Designed to be painted and thrown by the very youngest, myRoodi gets the cardboard flying everywhere, and especially in the kids' room! In other news, TicToys go international by taking part in their first toy fair abroad in Birmingham, UK. From this point on, our cardboard boomerangs are available in the United States, Japan, and even Australia! It's time to go big. Inspired by the classic Waldorf school see-saw, TicToys comes out with its very own fitness balance board. Das.Brett brings together everything that's great about our products: cool design, versatility, and all-natural materials. 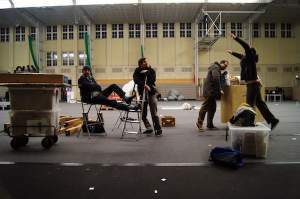 At this point, TicToys sets up a small workshop in Leipzig where we put the finishing touches on our boards.